My monochromatic card for today is using different shades of green. I love green. It is one of my favorite colors. 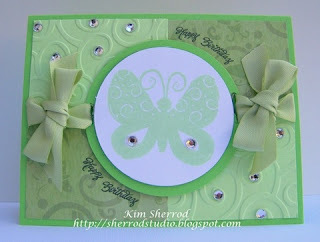 I embossed the light green cardstock using the Swirls embossing folder and added rhinestones to partis of the swirls. I then finished the card off with green ribbons. This is pretty fast to pull together.